Long Range Plinking with the 30-30. 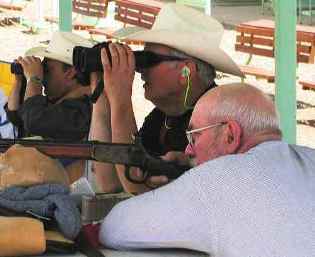 The Whittington Center in Raton, NM is the premier shooting site in the United States and possibly the world. 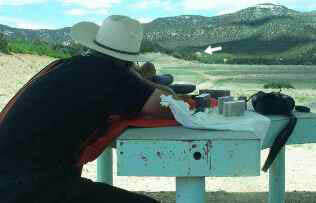 During Shootists Holiday 2004 I decided I wanted to do some long-range shooting with my old Model 94 Winchester 30 WCF. I shoot mainly cast bullets in it and for long-range work the RCBS-180-FN GC is my preferred mold... mainly because it's the ONLY heavy mold I have for the gun! I acquired it some years ago, it shoots accurately in the old Winchester, and I have seen no reason to use anything else. Trying to maintain a repeatable sight setting in this manner is really tough. My next 15 or so shots were into the clearing, some over, some under, all with 5 feet or so of the target. Then the wind shifted and I started missing the clearing again. Mic McPherson was coaching me by this time and said that perhaps the wind had changed direction completely "out there". I began holding the opposite direction and by the time I was 2 target lengths to the side I was back into the clearing with my bullet strikes. In the next 10 shots I hit the Buffalo solidly one time. Yep.. that's it. One hit on the target for about 70 shots. For those planning a vacation - drop by the Whittington Center in Raton, NM. 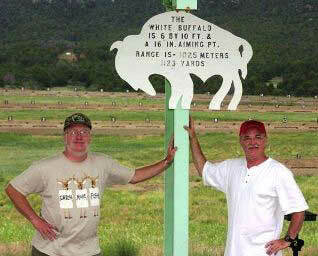 Take at least one long-range gun and try your hand on the Buffalo. It's still there.